Stephano was born in Tanzania, East Africa. A few days after his birth, his mother noticed a small swelling on his tongue. The swelling became progressively worse and she and her husband grew concerned. 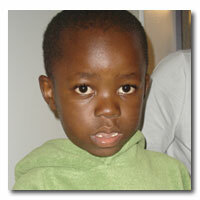 Stephano was taken to a local hospital and doctors were mystified by his case. They suspected throat cancer and told the family they would need to travel 12 hours by bus to the major city hospital for further treatment. Once there, doctors ran further tests and ruled out cancer. He was diagnosed with Lymphatic Malformation, which is a rare condition in which there is abnormal prenatal development of the lymphatic system that can affect any body part. In Stephano’s case, it was his tongue. Stephano’s tongue had grown so large that he was unable to close this mouth. The medical staff knew that Stephano needed an operation to help reduce the swelling but due to the lack of expertise and equipment they were unable to perform this procedure. Stephano’s father, Juma, refused to give up hope. He decided to go to the local media and plead for help. At first, it seemed that the media call was unheard, no one was responding. The family waited and eventually, someone responded. Mabula Sabula, from Toronto, Ontario, who is originally from Tanzania, saw Stephano’s story on the internet and was deeply moved by the story. He decided to fly to his home country and meet the family personally. Once there, he told them about Herbie Fund at SickKids and gathered their medical information. He then returned to Toronto and contacted the Herbie Fund to discuss Stephano’s case. Within six months, arrangements were made for Stephano and his father to travel to SickKids to receive treatment. Dr. Vito Forte, Otolaryngologist in Chief, assessed Stephano and let the family know surgery was possible. Dr. Forte was confident that surgery would significantly decrease Stephano’s swelling. The surgery was scheduled and it was a success. Stephano remained in hospital for a few days while he healed. Juma was with his son at all times and expressed immense happiness post surgery. He was so relived that the operation went well and that Stephano could lead a normal life. He recalls the first time Stephano saw himself without his swollen tongue – he remembers seeing a look of pure happiness in his eyes.